Zenfolio is an online photo-hosting company chosen by OnlinePix to display and market our photos. The main tool for ordering photos and products is the Buy button. It will be displayed on most gallery pages or displayed over the images in the site. Navigate to a photo you would like to purchase, click the Buy button at the top of the page. Choose Select product from the menu that appears. A pop-up window will open prompting you to choose which category of photo product you would like to order. If you would like to switch currencies or shipping location, click on Settings then select the desired currency and shipping destination. To change the way the product options are displayed, click the Product Catalog. Select the category you are interested in. A new pop-up window will open with available products and sizes. Use the options on the left to further narrow down the product choices. Look for the desired product in the main window. Hover the mouse pointer over the product then click on More Info to read a brief description of the product. Click Customize. The product configuration screen will be displayed. Click one of the cropping options to apply one of the preset cropping options, Center or Fit. 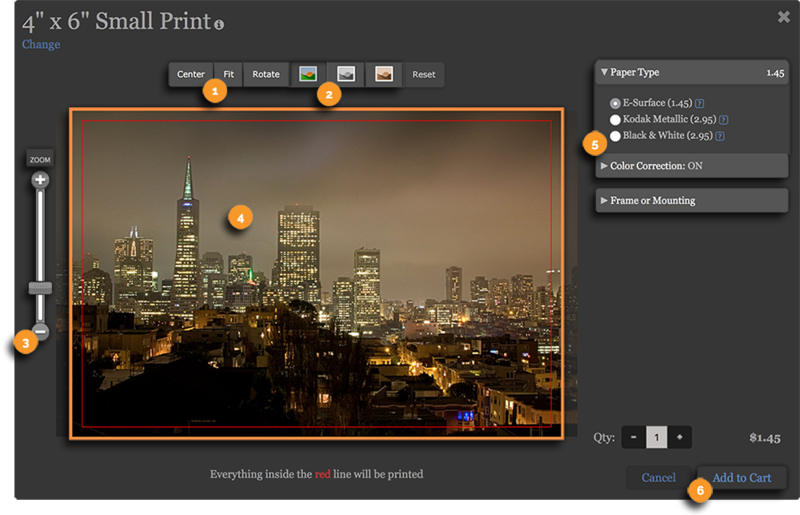 Optionally, click on of the color conversion buttons to convert the image to Black and White or Sepia. Any available product options will be displayed on the right. Make the desired changes here before the next step. Click Add to Cart. You will be returned to the gallery so you can purchase other images. Repeat until you’ve added all of the desired photos and products to the Shopping Cart. Once all of the desired items have been added to the cart, proceed with checking out. Click Proceed to Checkout to checkout and pay for the items in the cart. Please note, items added to the cart when not logged in are only stored for seven days. This means that the order for the items in the cart must be placed before the seven days or the cart will expired and be automatically cleared. The cart can also be cleared if the browser’s cookies are cleared. To save a cart and avoid losing the cart, click on Save Cart to save the cart to an account in your photographer’s site. If you’ve already created an account and you were logged in to the account when items were added to the cart, the cart is automatically saved to the account and will not expire in seven days (in this case, the Save Cart option will not be displayed). After clicking Checkout Now, you may be prompted to Register or Login. Registering a new account or logging in to an existing account allows you to store the order details in an account under your photographer’s site. This can be used to check on the status of the order as it proceeds. This also allows you to review previous orders. The option is also provided to Checkout as Guest. 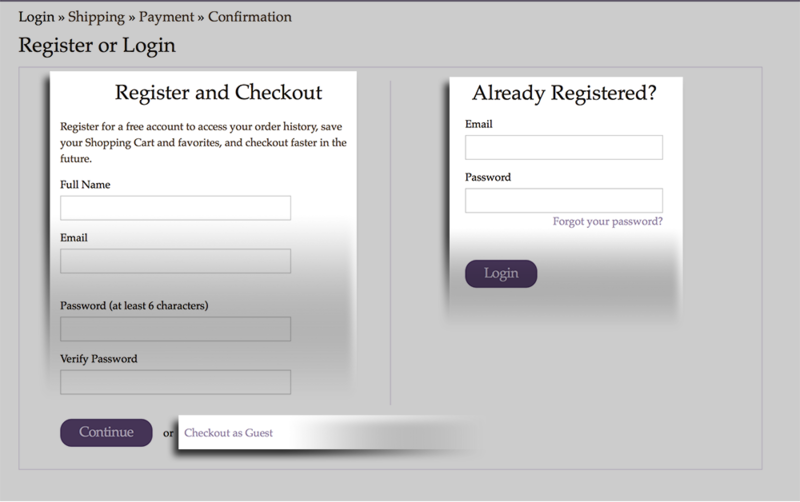 The Register or Login page will not be displayed if you’re already logged in to your account when placing the order. After entering the desired Shipping Address, choose the desired shipping method from the shipping methods displayed. The total will be updated in real time as the shipping method is selected. Any coupons provided by the photographer can be entered in this page into the COUPON CODE field. On the next page, you can enter your desired payment method and complete your order.